Historically, the Ĩyãħé Nakoda have always been self-sufficient, living in harmony with the land. Although the ancestral nomadic way of life ended after confinement to Reserve land in the late 1800s, the Ĩyãħé Nakoda have adapted...and will continue to thrive until the end of time. Tourism and hospitality, commercial, and industrial developments are key building blocks upon which to generate and prolong economic sustainability in present-day Ĩyãħé Nakoda territory. 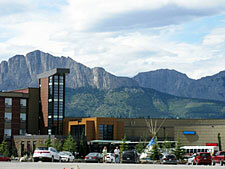 Natural resources exploration on Ĩyãħé Nakoda lands derives revenue and provides employment opportunities. Services in the forestry industry also offer jobs to the local labour force. Entrepreneurial initiatives within the communities reduce reliance on the local government for job creation. In upholding the traditions and culture of the Ĩyãħé Nakoda, environmental stewardship remains a priority when any proposals for land development are considered.